SPACE HAM. Menomonie’s Beth Jean has harnessed her musical talent and whimsical aesthetic to create silly, kid-friendly music videos. Beth Jean’s first business cards sported a picture of her riding a unicorn. Her childhood inspiration was Miss Piggy of the Muppets; in adulthood she looks up to Dolly Parton. Both had big personalities and big styles that Beth loved, along with glitter and glam, and in Parton’s case, charm and kindness. From the time she was young, Beth played violin, tap danced, and was enthralled when performers strutted their stuff on the television. Now she’s infused that passion for performance and love of sparkle into a self-titled album of children’s songs accompanied by exciting music videos. Beth Jean took her interest in the spotlight to Boston and Los Angeles, performing with Second City and producing a few pop songs that made their way onto MTV. But in time she was worn down by big city life, and found herself home in Menomonie. There, she rerouted her approach to music, focusing on the things she really loved about it: Having fun, being silly and outgoing, and tinkering with quirky instruments such as toy pianos and Benjamin Franklin’s invention, the glass armonica. “As much as I want to hear a kazoo on Top 40 radio, I think I’m probably more fit for kids,” Beth said. So she began writing songs about playing on a farm, reading books, and growing up to be a mermaid. But the music itself wasn’t enough; she wanted to create a world of fun characters and exciting scenes for kids to enjoy. 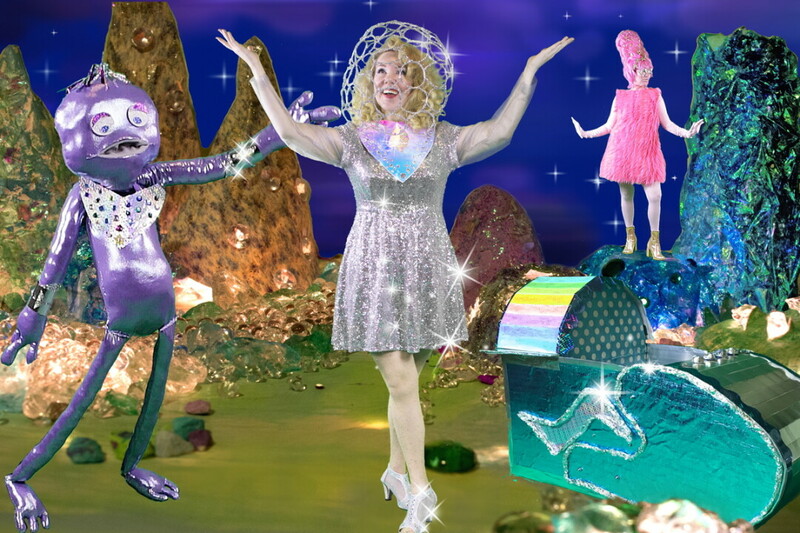 With the help of the “Art Department at Beth Jean Headquarters” (Beth Jean’s mother, Debbie), she took her basic video editing experience and produced her first music video, “The Martian Song.” Dressed in a shimmering space suit, she rides around in her ship and dances with an alien at the disco. She created the costumes, props, and sets from scratch, combining them using video editing software to build collage-like scenes. “Thank goodness for foam board and duct tape,” Beth Jean said. With the help of these trusty tools – and a lot of creativity – she has made videos for a song about sailing, one about how amazing reading is, and even a Halloween special done in rhyme. The songs were recorded and produced in Boston by Bleu McAuley and Ducky Carlisle, with orchestration arrangements by Paul Ahlstrand. Beth Jean worked on the videos and built the website while the album was wrapping up with final tweaks and edits. BethJean.com went live in October, and she has been uploading new content regularly since then. Beth Jean is inspired by the Beatles – Paul McCartney will have her heart “forever and always” – and fun ’60s pop hits such as “Itsy Bitsy Teeny Weeny Yellow Polka Dot Bikini” and “Purple People Eater.” She integrates wacky synthetic tones with pop-like melodies in some songs, and theatrical, driving tracks in others. It’s all in an effort to get kids up and dancing, celebrating their interests, and feeling good about themselves. Beth Jean’s self-titled debut album is available for download on iTunes, Amazon, and Spotify. Music videos can be streamed on YouTube or from bethjean.com.